On Saturday night, the SRT Motorsports Dodge Viper team were on top of the world. After three seasons where the sports car organization fought in the GT ranks in American Le Mans Series competition as well as this year's IMSA TUDOR United SportsCar Championship. At the Petit Le Mans at Road Atlanta, the SRT Motorsports group celebrated a double accomplishment after the full 2014 GTLM class season with their V-10 engine powered Dodge Viper SRT GTS-R. On Monday, Chrysler Group muted the any remaining victory cheers with a declaration made for 2015. Deciding to refocus the Dodge brand, Chrysler announced the SRT Motorsports sports car racing factory-backed effort has been dropped. The conclusion of a three-year effort started at the 2012 Mid-Ohio Sports Car round of the American Le Mans Series is shocking and even unexpected news. Coming as a surprise, Chrysler plan to discontinue factory funding of the Dodge Viper SRT GTS-R did not come without a hint appearing clearer in hindsight. Earlier this year, the SRT Motorsports team elected not to participate in the sports car racing crown-jewel event, the 24 Hours of Le Mans. At that time, Chrysler reported the decision for not returning to Le Mans was to focus on the United SportsCar Championship. Another possible indication consisted of the change in brand structure for Chrysler Group. After a three-year attempt of operating the SRT name as a separate brand, Chrysler decided to integrate the performance group into Dodge. The Viper, SRT's sole vehicle offering was also reunited into Dodge resulting in the return of the Dodge Viper. This is the second time Chrysler is removing support from their Viper supercar's sports car racing activities. From 1996 to 2001, Chrysler and French race firm Oreca successfully campaigned the Dodge Viper GTS-R on the world stage. Earning victories at the 24 Hours of Le Mans, Rolex 24 at Daytona and the Mobil 1 Twelve Hours of Sebring, the Dodge Viper evolved from just an insanely powerful sports car to a race-proven nameplate with a pedigree. Viper's return to factory-backed competition started at the 2012 American Le Mans Series race at the Mid-Ohio Sports Car Course finishing the 2-hour, 45-minute event's time distance. Supported by the SRT Motorsports banner, first won in 2013 in the American Le Mans Series race at Road America. Drivers Dominik Farnbacher and Marc Goossens wheeled the #91 car to GT class victory. 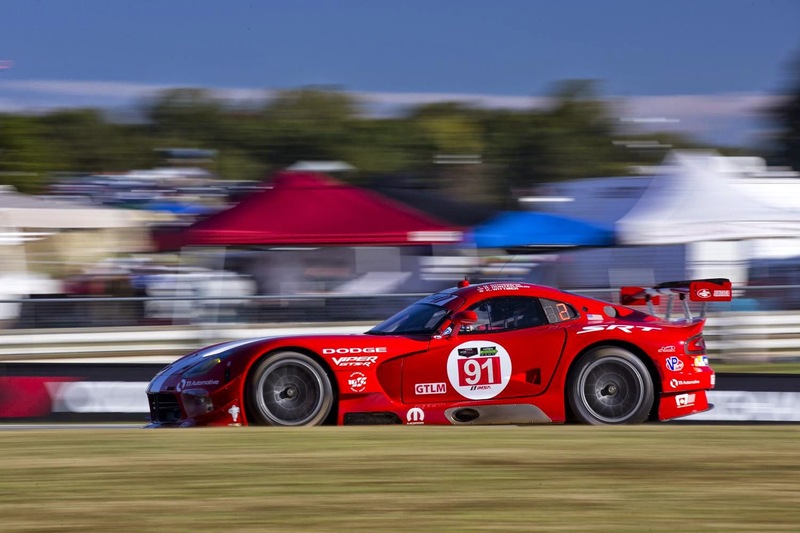 In 2014, the SRT Motorsports Vipers competed for the full season in the United SportsCar Series' GTLM category. The Viper SRT GTS-R found victory in class twice at the road course of Indianapolis Motor Speedway and the Circuit of the Americas. Both times the winning driver team paring Canadian Kuno Wittmer and American Jonathan Bomarito piloted the top entry. So what does the future hold for the snake's presence in competition? The decision does not prevent privateer efforts from entering next year's United SportsCar Championship. After Chrysler's first official withdraw from factory support of the Dodge Viper, the car continued to enjoy some success in regional sports car championship. The car won the overall race victory at Belgium's 12 Hours of Spa and Germany's 24 Hours of Nurburgring in 2002. Also at the German sports car endurance race, the Viper GTS-R won its class three consecutive years from 2005 to 2007. However, the cut-off of factory involvement will largely limit the Dodge Viper SRT GTS-R's development against rivals like the Chevrolet Corvette C7R and the Porsche 911.